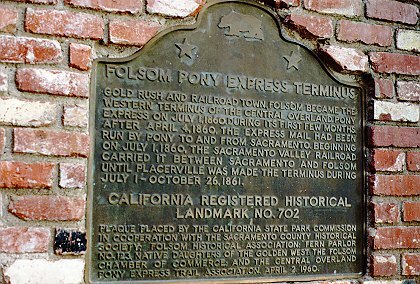 Gold rush and railroad town, Folsom became the western terminus of the Central Overland Pony Express on July 1, 1860, during its first few months. After April 4, 1860, the express mail had been run by pony to and from Sacramento. Beginning on July 1, 1860, the Sacramento Valley Railroad carried it between Sacramento and Folsom until Placerville was made the terminus during July 1-October 26, 1861. 819 Sutter St near Decatur, Folsom.